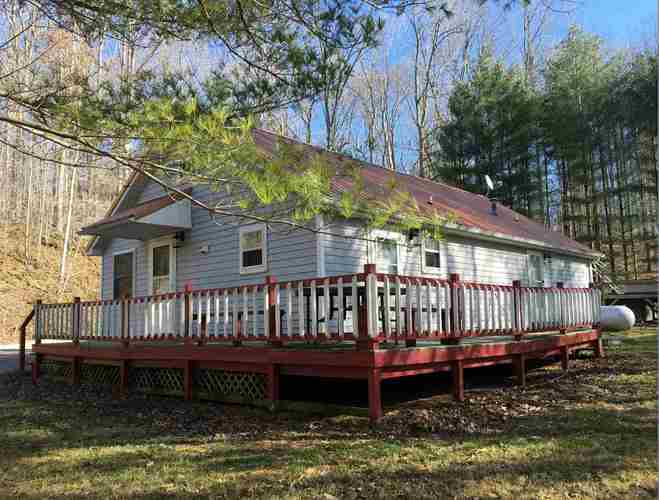 The privacy, beautiful wooded setting and convenient location is what current seller loved so much about this property. The 3BRm, 2BA home has 1500 fin. sq. ft. of living space, a partial basement for extra storage plus a large 832 sq. ft. detached garage/workshop situated on 4.4 Acres. Some of the bonus features are the attractive copper colored metal roof, a cool pavilion built at the edge of the woods, the wooded land for hiking, the fun creek which flows year round and the pool which is in good condition and requires very little maintenance. Also included is a Vermont Casting Blue Enamel wood stove to add warmth and charm to this home. Easy access for Indianapolis commuters and only a 20 min. drive back to Bloomington. The detached garage is insulated with its own 200 amp service. The tiny house is just plain cute. Directions:From Hwy 46 in Spencer, turn North on Hwy 67 at the McDonalds restaurant. Go 1 mile. Turn left on Woodland Rd. Turn right on Clover Dr. House will be on your right at the top of the hill.